The region has needed a regular journal that won’t be as exclusive as, say, The Fiddlehead (a fine, fine journal) or some of the other journals in the area. Galleon will focus on Atlantic Canadian authors and one of the four issues will focus on New Brunswick. But there’s much to be done. Time to get this boat on the road, get this ship motoring down the speedway. The goal is a first issue, a New Brunswick-themed issue, out by end of June. So for the next two weeks we raise funds, scour for subscriptions and submissions. 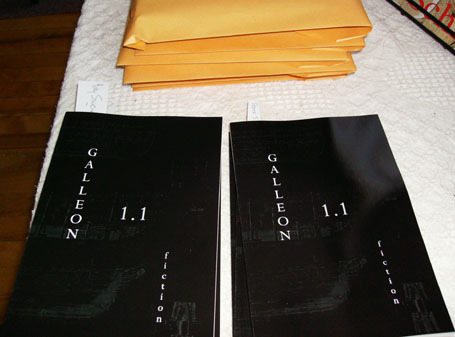 Galleon had a former existence, 2 issues and some 21 stories (and one novella) published. That was fun.